You have a bright, energetic, creative child—and you desire to see them enjoy a life filled with academic achievement, affirming friendships, productive careers, and a sense of purpose that guides them. You want your child to have more than the ability to take a standardized test. Your goal is to equip them for success in every area of life. At Primary Montessori Day School, we believe that giving your son or daughter the best education is about much more than teaching them to read, write, and do arithmetic. While those skills are important, they take on their significance from the wider context in which they occur—they are part of a wide range of skills that prepare children to succeed in life. And the Montessori approach has a proven track record of equipping children with great tools for navigating work, relationships, and other areas of life with success. Here’s a closer look at how a Montessori education promotes achievement in your child’s life—both now and in their future. If you want a sense of how influential the Montessori method can be, just ask today’s accomplished CEOs, business leaders, innovators, and artists. People such as Larry Page and Sergei Brin (the founders of Google), Jeff Bezos (CEO of Amazon), Grammy Award-winning artist Taylor Swift, author Helen Keller, and management guru Peter Drucker all enjoyed an early Montessori education that helped provide them the foundation for their careers. Even Harvard credits Montessori as an essential building block for success in later life. In many ways, the Montessori classroom mimics the world of work, offering your child practice at developing skills that will serve them well throughout their career. Your child will be encouraged to develop a sense of teamwork with both older and younger children. And by allowing your child to pursue their education at their own pace, one-on-one, your child can foster the independence, self-discipline, and confidence needed to spearhead work projects, find innovative solutions, and be a leader on their job. 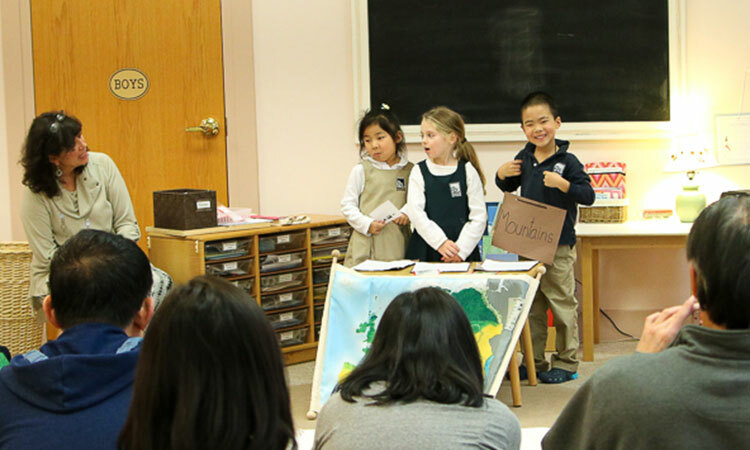 A Montessori education inspires children to appreciate the world around them. From the moment your child steps into the classroom, they are greeted by teachers and fellow students and given many opportunities to engage in positive interactions. Respect for the viewpoints of others is encouraged. Students engage in collaboration too, mentoring each other. Respect for the environment is taught through activities that range from cleaning up the classroom after lunch to exploring nature and sharing discoveries. As a result, your child develops a keen sense of how to graciously, kindly, skillfully interact with others. They come to appreciate diversity in all its forms. And they appreciate the world around them, taking care of where they live, study, and play. This ability to care for others and for their environment equips them to do well as they interact with people on the job, at home, and wherever else they may go. One of the greatest gifts a Montessori education can offer your child is a lifelong love of learning and the confidence that they can learn anything they set their mind to doing. This passionate belief in their ability to grow and make a difference is foundational to success later in life. It equips your child to do well in an ever-changing workforce, and gives them a sense of purpose that leads to greater satisfaction in life. It is also worth noting that people who love to learn and believe in their ability to grow don’t get weighed down when obstacles arise. Instead, they see roadblocks as opportunities, and they keep making forward progress. The Montessori method teaches your child this crucial mindset for success by allowing your child to experiment, learn at their own place, explore, and identity the positives in the work they do in the classroom. Finally, a Montessori education is an excellent way to prepare your child for future educational success. An authentic Montessori classroom staffed with well-trained teachers can provide the perfect environment for your child to learn academics—including math, science, reading, writing, and more—even in preschool and early elementary stages. The knowledge you need to make an informed, wise decision about your child’s education is at your fingertips. As you research your options and consider the advantages of a Montessori education, we invite you to explore our website and discover more about Primary Montessori Day School’s history and our unique benefits. And when you’re ready, visit our school and see for yourself what Primary Montessori has to offer you and your child. Call our attentive staff anytime at (301) 309-9532 or use our convenient online form to Schedule a Tour. In the meantime, download our Free PDF, “A Balanced Education: How Montessori Prepares Your Child For Success in Every Area of Life”. Get tips to implement Montessori methods at home and see the difference they make.